Black-billed Cuckoos are among the species more likely to be heard than seen. Their habit of waiting motionless for long periods watching for prey to move makes them difficult to detect, but their monotone cu-cu-cu song carries well through the forest. Like Yellow-billed Cuckoos they eat hairy caterpillars, which they will shake and whack on a branch before swallowing. Black-billed Cuckoos are uncommon migrants and rare breeders in Tennessee. Their breeding range includes southern Canada east of the Rockies, the central U.S., and eastward to Virginia. Black-billed Cuckoos winter entirely in South America. 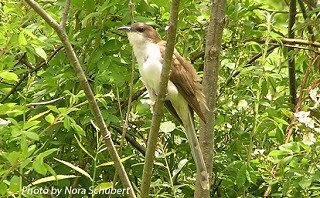 Description: The Black-billed Cuckoo is a slender, medium-sized bird that is grayish-brown above and whitish below. It has a long, slender tail grayish-brown above, and darker below with thin white crescent-shaped spots on the tips of the tail feathers. The bill is black and they have a reddish eye-ring. Both male and female look alike. Voice: The song is a fast series of 3 or 4 cu-cu-cu phrases. They may sing at night. The Yellow-billed Cuckoo, much more common in Tennessee, has a yellow lower mandible, a prominent rusty patch in the wing, a yellow eye-ring, and has much larger white spots under the darker tail feathers. Habitat: Forest, forest edges, and thickets, frequently associated with water. Diet: Large insects, and especially caterpillars and cicadas, some fruits and seeds. Nesting and reproduction: Breeding density, and the timing of breeding appear to be correlated with local food abundance. Clutch Size: Usually 2 to 3 eggs, with a range of 1 to 6. Incubation: Both adults incubate the eggs for 10 to 13 days. Fledging: The young are fed by both parents and develop quickly, leaving the nest in 7 to 9 days. They are flightless for several days after fledging. Nest: Both adults probably build the flimsy platform or shallow cup of interwoven twigs and grasses, lined with softer material, and usually placed in a small tree. 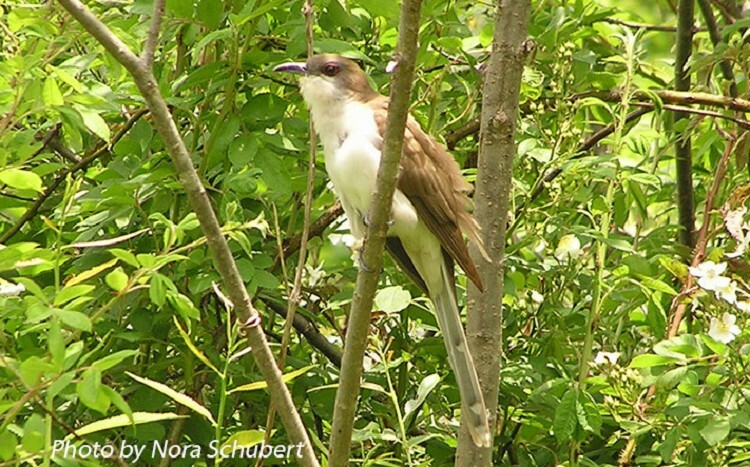 Status in Tennessee: Across Tennessee, the Black-billed Cuckoo is an uncommon migrant, and a rare summer resident, very rare in West Tennessee. Spring migrants are in the state from late April to early June, and fall migrants from mid-August to early October. Black-billed Cuckoos eat spiny caterpillars. The spines of these caterpillars get stuck to the lining of their stomachs, like a coating of fur. The common name "raincrow" comes from the tendency of both the Yellow-billed and the Black-billed Cuckoo to call more frequently prior to the onset of rain. Worldwide, most species of cuckoos are "nest parasites," laying their eggs in the nests of other species. Black-billed Cuckoos only occasionally parasitize other species. Best places to see in Tennessee: Always a difficult bird to see but found in woodlands across Tennessee during migration, small numbers breed in the mountains of East Tennessee. Hughes, J. M. 2001. Black-billed Cuckoo (Coccyzus erythropthalmus). The Birds of North America, No. 587 (A. Poole and F. Gill, eds.). The Academy of Natural Sciences, Philadelphia, PA, and The American Ornithologists' Union, Washington, D.C.